Welcome to Myrons Carb Service and Jetting tutorial. As most of you know, the main function of a carburetor is to blend the gasoline with air to make an explosive mist of super fine droplets. In order to burn all of the oxygen and all of the gasoline, they must be in the right ratio, or else oxygen or gas will be left over, and wasted out the exhaust pipe. The carburetor also has a control valve, in most moped carburetors it is a slide type, that controls the power of the engine. When you want to accelerate, twisting the right handlebar grip towards you pulls a cable that pulls the throttle slide up. This “opens the throttle”, and lets the maximum amount of air get through. Moped and motorcycle carburetors also have a small reservoir of gasoline, called the float chamber or float bowl. 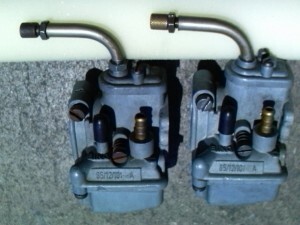 An automatic valve attached to a float lets gasoline into the reservoir when the level gets too low, and shuts off the supply of gasoline when the level gets too high. The reservoir insures a fairly constant supply of gasoline, even when the demand changes as when the rider opens and closes the throttle. The float is operated by gravity, so when the bike is laid over on it’s side, and the fuel petcock is on, gas will leak out, either onto the ground, or into the air box and engine, or both. Always turn off the gas (fuel petcock at bottom of gas tank) before transporting the moped. One or more jets dip into the reservoir of gasoline. Suction from the engine draws gasoline up through the jets. The gasoline sprays out with fairly low pressure, like with a squeeze bottle sprayer with the trigger squeezed lightly. The pressure in the venturi is less than the pressure in the float chamber, which is at atmospheric pressure, thanks to one or more vents that allow air to escape from the float chamber when gasoline comes in, and to enter the float chamber when gasoline leaves. The biggest jet is the “main jet”. The size of the main jet is what determines the fuel and air mixture when the throttle is wide open. The other jets, needle jets, idle jet(s) or choke jet, matter only a little bit when the throttle is wide open, but matter a lot when the throttle is closed. On a Tomos A55, the idle jet is about 0.010″ (0.25mm) and the main is about 0.023″ (0.58mm), 2.5 times the diameter, and 6.4 times the area. So when the throttle is wide open, 86% (6.4/(6.4+1)) of the gasoline comes from the main jet and 14% (1.0/(6.4+1)) from the idle jet. Sometimes the “idle jet” is part of the carburetor body and cannot be removed for cleaning or replacement. In those carbs, Peugeot Gurtner, Motobecane Gurtner, Delorto SHA, and others, there is a drilling procedure for cleaning, widening or relocating the idle passageway. In some there is no idle fuel passageway. Bing moped carbs use a channel in the bottom of the throttle slide to focus the air close to the fuel sprayer. Make the idle channel in the bottom of the throttle slide deeper, and the idle mixture will be richer. Make the idle channel shallower, and the idle mixture will be leaner. Closed Throttle (Idle) Mixture is usually not adjustable, except by drilling or notching the bottom of the throttle slide. Mid-Throttle Mixture is governed by the needle and needle jet, if it has one. Puch & Sachs Bings do, Delorto SHA doesn’t. Full Throttle Mixture is goverened by the main jet size. The number is, somtimes, the size in mm. So a size 50 jet is 0.5 mm. Try not to confuse throttle position with engine rpm. “Mid range” can mean the middle of the RPM range, or it can mean the middle of the throttle range. The main jet is always removable, and unscrews from the lower part of the carburetor since it is “underwater”. 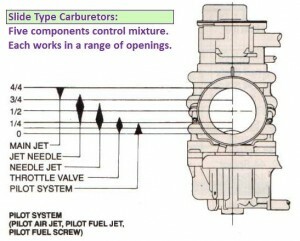 In most motorcycle carburetors the main jet is internal, where the float bowl must be removed (that usually means carb removal). 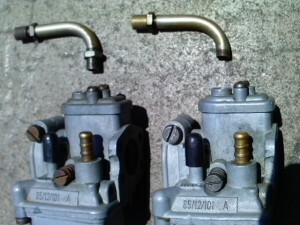 In some moped carburetors, it is external, like Peugeot Gurtner, Batavus Encarwi, Tomos Encarwi, and Motobecane Gurtner. Those lucky moped owners can drain their float bowls by simply unscrewing the jet. The jet can also be cleaned or swapped out in under a minute. Above, a Tomos A55 idle jet (M4 thread) is physically bigger than a Puch Maxi main jet (M3.5 thread), but the hole size is much smaller. The photo shows how the #25 jet, 0.010″ (ten thousandths of an inch), will allow the thinner wire of the wire wheel to pass through the hole, but not the thicker wire of the wire brush. This is a useful cleaning technique. With most stock moped engines, it’s easier to judge whether the jet is too big or too small, than it is with high performance two stroke engines, like dirt bikes. A stock moped with the correct jet will run smooth up to and a little beyond the engine rpm it is designed to max out at, and then, above that rpm, begin to “four stroke” or run rough. You want it to just barely not four stroke under most conditions. If the jet is too big, the “four stroking” will begin too soon, before maximum speed is reached, and act as a brake. If the jet is just right, the “four stroking” will begin a little above max speed , going downhill or wide open stationary with the tire off the ground. If the top speed is 30mph, the four stroking should begin at 33-34mph. If the top speed is 35mph, the four stroking should begin at 38-39, and so on. If the jet is too small, the “four stroking” will begin too late or not at all, even above top speed. Furthermore, if the jet is too small, power will fade out, without any roughness or stumbling, like a “waaaaaaah” sound, when the throttle is opened fully. This condition will cause excess heat, which can then damage the piston or worse. A little too hot is when the two stroke chrome exhaust header turns yellow. Way to hot, for a two stroke, is when the chrome turns blue, like a four stroke exhaust header often does. Carburetor Replacement. When starting from “scratch” with a whole different carburetor or a different engine set up, the tuning books all say to start with a jet that’s too big and work down. Putting too big a carburetor will make it difficult or impossible to jet properly. When the carb is too big, you cannot make as much power at full throttle as you can at part throttle. There’s not enough suction from that little 50cc piston. Piston port kitted mopeds can benefit from big 20 to 24mm carbs. Reed valve 70cc kitted mopeds and non kitted 50cc sport motorcycles and scooters benefit from smaller carbs, 16 to 20mm. Smaller carbs start easier, idle better, they’re more fuel efficient, they take up less space and don’t stick out as much. The big carb might go a little faster but behave badly. Seat of the pants jetting is where you use a public street run the bike at maximum power for maybe 1/2 mile to 5 miles (eventually), listening to the sounds and feeling the forces made by the engine, to decide if the jet needs to be bigger or smaller. Each engine has it’s own personality. Some you easily hear the four stroking, and some you cannot hear it at all, but you can sort of feel it literally in the seat of your pants, like someone tapped the brakes. When the rough running mode begins the driving force suddenly drops, and you begin to loose speed. When the rough running ends and the smooth running begins, you suddenly feel a tiny surge of power, and your speed begins to increase. Seat of the pants jetting is also knowing the smell of “too hot” and how to judge how hot it gets by “reading” the spark plug. 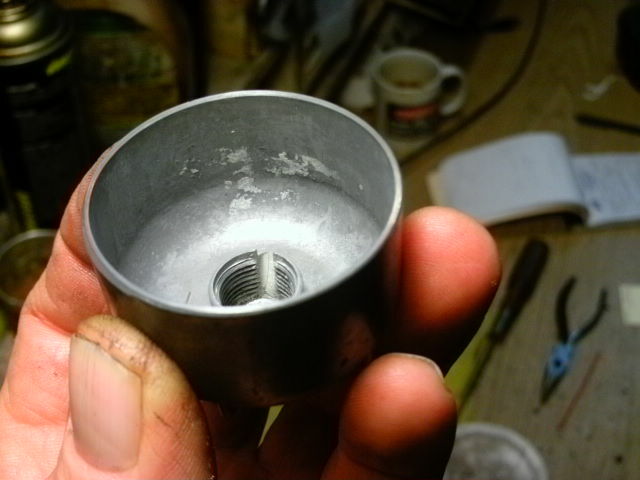 The hottest thing in the combustion chamber is the center part of the spark plug, the insulator, made out of white porcelain. On a normal spark plug there will be a light brown coating. On a hot running bike the same plug will be a lighter shade or almost white. On a cold running bike the same plug will be a darker shade of brown. Many other things also influence the spark plug insulator color, and can mask the effect of jetting, such as two-stroke oil mix type and ratio, old gas tank tar, compression leaks, spark plug heat range, and various engine modifications. For this reason a digital temp gauge is recommended. High tech jetting is done using full instrumentation like temperature sensors, exhaust oxygen sensors, in addition to a dynamometer. Graphs of engine rpm versus rear wheel driving force/torque/horsepower, are made for various jet sizes. The jet that provides the most driving force yet still runs cool is the best choice. What is cool? Below 300 degrees fahrenheit at the threads of the spark plug, after 30 minutes of hard running on a super hot day. What is hot? Above 350 degrees, also when fully hot. Having too much compression ratio (not enough combustion chamber volume) is a common source of excess heat in modified engines. So is too much ignition advance. Liquid cooled two stroke motorcycles run cooler, like under 250 degrees F. Cooler engine temperature makes more power because the crankcase can hold more weight of air since cooler is denser. That’s why all modern racing two stroke engines are liquid cooled, more power and longer life. Bigger cooling fins run cooler on air cooled, as do bigger radiators on water cooled. Moving fast through the air cools the engine. Going slow in the sand, or uphill with a heavy load on a hot day, overheats the engine. Because of all the many variables, jetting is often not easy. The bike must be otherwise in good working order and street legal, before the final jetting is done. When just an exhaust is changed, from stock to aftermarket, usually the jet needs to be 1 or 2 sizes bigger. When the air box is removed the jet needs to be 2 or 3 sizes bigger. Some mopeds are missing their air box, and a replacement is not available. They must be jetted richer, or they’ll run hot and lose power when the throttle is wide open. Sometimes the jetting can be adjusted by different air inlet tubes that plug into the air box. They are for noise reduction. The Delorto air boxes have two 1 inch by 3/8 inch plastic inlet tubes. When they are removed, and a bigger jet is installed, some more power is often gained, at the expense of more noise and less fuel economy. For example, a stock Garelli has a #50 jet with intake restrictors. Remove one of the two inlet tubes and it likes a #52 jet. remove the other and it likes a #54 or 56 jet. Speed might gain from 30 to 32 mph. Another example is the “snorkel tube” on the Puch Maxi stock air box. It should never be pushed up against the metal mesh air filter inside the air box, but rather be placed about a half inch away from the metal mesh, or else the air will be very blocked. Puch changed that design in the mid eighties and made it fool proof. Removing that accordian style inlet tube lets more air in, about equivalent to reducing the jet size by one or maybe a half step. When an engine that is jetted correctly for a low altitude is moved to a high altitude, like from sea level to 6,000 feet, the air is thinner, so the jet will need to be smaller by 1 or 2 sizes. At 8000 ft maybe two sizes smaller. The power output will be less. When an engine has leaking crank seals it will need a bigger main jet and a much bigger idle jet, because some of the fresh charge will escape, while some fresh pure air will enter the crankcase, diluting the mixure. At lower rpms, due to momentum, the leak has more time to happen, so the engine will feel weak. At high rpms the weakness won’t be that bad. One trick is to cut a notch in the throttle slide to cause all the idle air to pass close to the idle hole where the gasoline sprays out. Notching the throttle slide enrichens the idle mixture to compensate for air leaks in the crankcase, and compression leaks in the piston and cylinder. The notch can be filled with epoxy to restore it, or the throttle slide can maybe be replaced, to undo the modification. If there’s an idle passageway, it can be made wider, by drilling, to make the idle mixture richer. 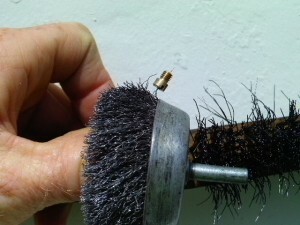 A Delorto SHA idle hole is in the zinc body below the base of the vertical brass spray tube. It is stock about drill size 73. It’s common for an air-leaking older engine to benefit (idle better) by widening the Delorto SHA idle hole to drill size 71, and even all the way up to drill size 68. When the engine has low suction, the idle hole needs to be huge or else it won’t idle. The droplets then are bigger and the idle is rougher. It’s either that or it’s an expensive engine overhaul or new engine. Wear eye protection. Read warnings. Carb spray is a strong solvent. It will damage paint and most plastics, as well as human flesh. Carb dip is also a mix of strong chemicals that will burn skin, cause blindness, or mess up your nice new paint job. Use caution. These procedures are not for everyone. Use your own judgement. Read and follow the warning labels. Use this at your own risk. It’s easy to do more harm than good. One tiny flake of this white crust became lodged in the float chamber vent hole, causing this almost new Puch carburetor to leak gas, and also to starve for gas sometimes, for no apparent reason. A quick clean is to remove the float bowl, keeping it vertical so as to not spill the gasoline it contains. If the carburetor has no been cleaned recently it might be all coated with brown or yellow varnish or white zinc oxide corrosion. If it is then a full clean is needed. If the carb is already clean inside, then inspect the gasoline for several possible contaminants. One tiny spec or fiber is all it takes to block a jet hole. See Gas Tank Cleaning section. Remove the jet and hold it up so your eye is looking through the tiny hole, with like a sunny white wall in the background. A normal jet will be wet with clear liquid that tranmits light. Blow air near it lighty with your mouth. Now the liquid will be gone. It should look like a solid white circle. A blocked jet will be black, and a flake or a fiber will make the hole look non-circular. Be aware of reflections from the brass walls. Clean out the jet, if it is blocked, with a piece of thin wire, like from a wire brush or the smallest guitar string. Better yet use a jet drill of a slightly smaller size, as a tiny round file, to scrape off the varnish from the inside of the hole. See the Bing or Delorto Jet Sizes Charts for drill numbers and jet numbers conversions. A full clean is to disassemble the carburetor, separate out the rubber parts, and then soak the carb body and non-rubber parts in carb dip, or spray them with carb spray and maybe scrape the float bowl with a pocket knife or with steel wool. Polish the float seat with a spinning Q-tip on a drill. Clean out and test spray the passageways. Be careful not to spray it at your face. Look up the specific layout of your carb to know where any “secret” holes are at. Spraying up from where the main jet goes should cause spray to come out all available verturi holes, sometimes one, two, or three, depending on the carburetor. How to fix a broken “carb elbow”: The carb elbow is a curved metal tube that redirects the throttle cable at the top of the carburetor. Not all moped carburetors have a carb elbow. Instead they have linkage, like Peugeot 103 and Derbi DS50. Without a carb elbow, the throttle cable would go straight up, and interfere with your leg when you step through the frame to get on the bike. Without a carb elbow, the throttle cable would be different, since there’s length missing from the outer stationary part of the throttle cable. Some carb elbows have threads and screw into the top of the carburetor. Some don’t have threads and just rest in a hole in the carb top. The threaded kinds often get broken, usually by getting kicked. Fortunately, there’s an easy and free remedy. Above left, unbroken and broken carb elbows removed. Above right, unbroken and broken carb elbows installed. Usually it breaks at the bottom of the lock nut, leaving a few good threads where the lock nut was. Eliminate the lock nut and possibly file the broken edge if it sticks out. Then screw the broken carb elbow into the carb top, without any lock nut. Then turn the adjuster at the other end of the carb elbow, if it has one there, to take up the slack caused by the missing section of the carb elbow. Lube the throttle cable before reassembly. How to fix a sticking throttle: Be aware this is a potentially dangerous condition. Don’t let anyone ride the bike until it’s fixed. Lube the throttle cable, and throttle sliding block, if it has one. Visually check the cable for kinks, or too many bends, or a crushed spot. Straighten out any kinks and remove excess cable ties. The cable should go as straight as possible, yet not hang out or dangle. If it hangs out it can get caught, and either kinked or crushed by the steering stop. Routing needs to be near the steering tube of the frame, so that when the steering is turned, it does not affect the throttle. Look at the original factory photos of mopeds in Myrons Moped Encyclopedia, to see how the throttle cable is supposed to go for your particular bike. It might not show it or say it all the way. If it still sticks try moving the throttle further out on the handlebar. Sometimes when a moped falls over, the throttle gets pushed inward, and rubs on the end of the handlebar. If that’s not it, then disconnect the throttle cable to isolate the throttle control from the throttle cable. Pull on the throttle cable with your fingertips or a small pliers. It should feel free and smooth, not rough or raspy, and snap back freely. Then twist the throttle control. It should also move completely free, like a wet ice cube on a smooth table. Replace the throttle cable with a modern kind with a slippery lining of nylon. Some throttles clamp onto the handlebar, and some have a cone shaped wedge that digs into the handlebar. After usually thousands of miles, a wedge type throttle might get loose because of erosion of the handlebar. Then tightening the wedge bolt can cause the throttle to stick because it becomes misaligned. The remedy is to replace the handlebar, or the free and easy option, reposition the throttle a little (1/2″) further out, on a fresh section of handlebar. Finally, sometimes when you change handlebars, the new bars might cause the throttle to stick, either because the throttle is misaligned by being positioned on the part of curved section, or the handlebar is too thick, like some powder coated ones are, and the thick paint needs to be sanded off where the throttle twist tube rubs against it. If you changed to low bars, without shortening the cables, it might be from the four extra 90 degree bends, where the cable has to turn up, u-turn over the top, and turn horizontal again at the bottom of the roller coaster. Sometimes throttle sticking is caused by too much grip glue. Sometimes it’s from a worn out sliding block. Allways lube cables and throttle first, and every so often, but not with WD40. Use oil, grease, or cable lube. Vegetable oil or Vasoline is better than WD40. WD40 is a penetrant and a Water Displacing agent. It’s great for the first time, because it gets in deep and fast, but doesn’t last long. Regular motor oil is better for follow up lubing. Moped carburetors come in different sizes from 7mm to 14mm venturis, and from #39 to #68 main jets. A Puch carb might be a 14mm Bing with a 64 jet, while another Puch carb might be a 12mm Bing with a #60 jet. So there are different configurations. When you get a new carb, you generally have to re-configure it. That means learning about jetting. Final jet selection requires a safe, legal, operating bike that can run hard wide open. The engine temp is “sensed” or smelled or a digital temp gauge is used. Read more about that in Service. The point is, it’s generally easier to repair the old carburetor, than to purchase and re-configure a new one. That said, many people put new Dellorto SHA14/12 or 15/15 carbs on older mopeds. They don’t leak but they’re not jetted right. Not all mopeds have the right intake pipe diameter. The carburetor must fit precisely. Getting the right adaptor sleeve is sometimes not possible. The various intake pipe clamp diameters are listed in the Dellorto SHA parts list. 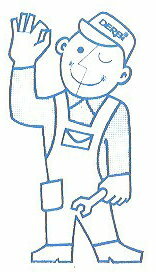 Myron Derbi Goodwrench wishes you a safe, happy and successful carb service. You are currently browsing the archives for the Carb Service & Jetting category.